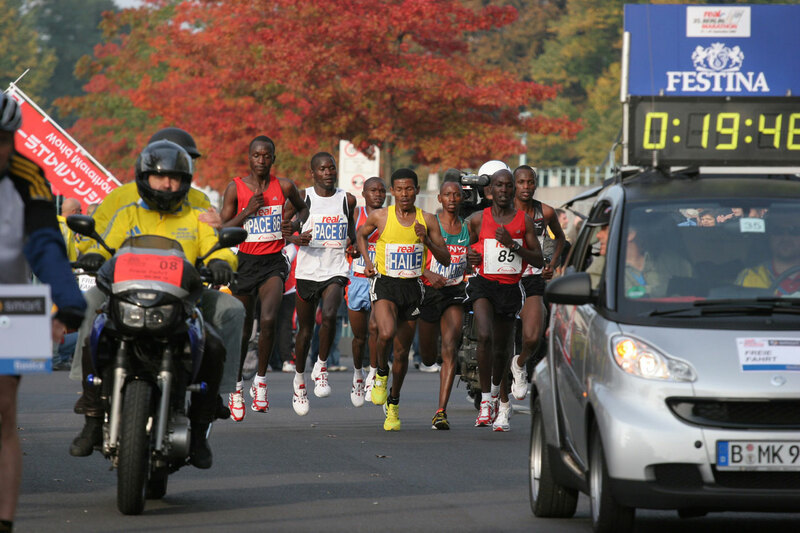 2008 Berlin Marathon // A world record for Gebrselassie? This Sunday sees the first of the Autumn marathons, and it’s a big one, with Haile Gebrselassie making a big effort on his own, 1-year old record in the Berlin time-trial…er, Marathon. Whenever an athlete of Geb’s caliber lines up, the talk of world records is inevitable, but this particular race is even more in focus than usual, because this is the event that cost us the opportunity of seeing Gebrselassie in the Olympic Marathon in August. You’ll recall that it was earlier this year that Geb announced that he would not run the Olympic Marathon because he did not want to “damage” his long term-health in the polluted Chinese capital – many were sceptical then, suggesting that the big pay-day of a Berlin World record was the real reason he didn’t run. And now, 6 months later, that potential pay-day has arrived. Geb will line up in a race that really does lack competition, at least in terms of what he’s probably going to be asking of his pace-makers. The World Record, you’ll recall, stands at 2:04:26, and averages 2:57/km. Given that the next fastest man in the race has a 2:07 PB, and that the half-marathon mark is likely to be reached in 62 minutes, it’s hard to see how anyone will be within a kilometer of Gebrselassie by the time he approaches the Brandenburg Gate and the finish line. The talk is all about the record – the race is secondary (or non-existent, unless we have a miracle performance by someone, or a disaster run by Geb). Can he go sub-2:04? One year ago, as tends to happen when world records are broken, people waxed lyrical about the first sub-2 hour clocking. Never mind that it was “only” 4 and a half minutes away. The more “conservative” types were talking of a 2:02 within the next few years, and Gebrselassie himself said 2:03 was on. And that’s become the magic number for this year’s race – 2:03-something. In order to become the first man to break 2:04, Gebrselassie will have to run just over 0.5 seconds per kilometer faster than he did last year. Sounds pretty straightforward – after all, 0.5 seconds represents about 3 m for every 1000m. When you look at it that way (a 0.3% increase), the sub 2:04 seems a reasonable guess. But as you’ll know, it’s far easier said than done. The race was a textbook example of how to pace a marathon race – the early pace was a little bit quick, but settled up to halfway, which was reached in 62:29. The pace then picked up in the second half, which was run in an incredible 61:57. Between that race and Sunday’s, Gebrselassie ran one other marathon, in Dubai. There, his pacing was not quite so assured – the first half was run in a suicidally quick 61:27. He died somewhat in the second half, coming home in 63:26 for a 2:04:53. That Dubai race is an illustration of just how fragile the pacing strategy for the marathon can be…then again, the Berlin race last year demonstrates the same thing. Note how Gebrselassie never ran any 5km segment slower than 2:59, but that his fastest split, in the final 2.2km, was run at 2:53/km. The consistency in pace is remarkable, and it illustrates just how close to the limit Gebrselassie was. For that reason, talk of a sub-2:04 may be a little optimistic, unless his training has been much better for 2008 than it was last time around. Given the “distraction” of the Olympic 10,000m, I find that unlikely. 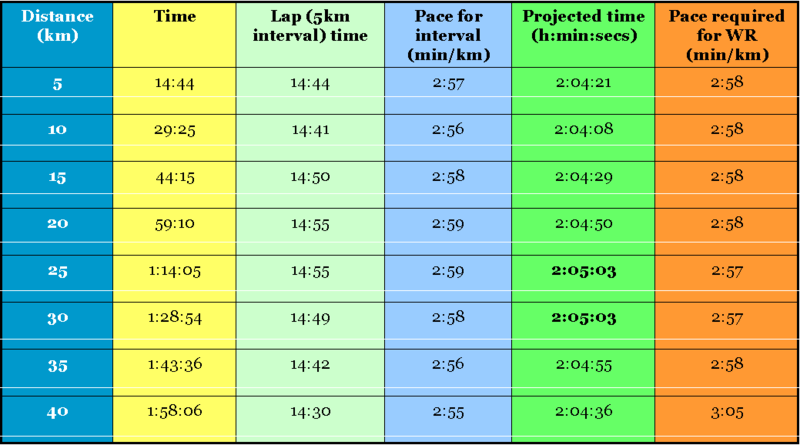 To run a sub 2:04 would require a half-way split of around 62:00. At the slowest, I’d say 62:15, because to run a second half in sub-62 minutes off that pace would be a very difficult task, if not impossible. But an over-ambitious start, say 61:50 for the first half, may also see record chances disappear. The margin for error is thus so small that the pacemakers have an enormous responsibility – 15 seconds either way, over 21km, is their margin for error. The other story is that Gebrselassie may not have too many more shots at the record – he is running great times over 10,000m this year, an encouraging sign, but at the age of 35, it’s hard to see that he has more than 4 more great races in him. Then there’s the emergence of some real challengers – Sammy Wanjiru ran 2:06:32 in Beijing’s heat and humidity, in a tactical race with a brutal early pace. Incredible performance, and maybe Geb is lucky he didn’t try to run that race – he would likely not have won anyway. And there’s Martin Lel, beaten in Beijing, but invincible before. He’ll be back and I still favour him to run the world record close. Regardless of who it is, I feel that this time of 2:04:26 will be beaten within the next 18 months, and so Gebrselassie will want to “pad” it with some reserve. Geb will get the pacing slightly wrong and go out a little bit too fast (around 61:45). He’ll pay for that in the second half, and fall just short of the world record – 2:04:40. Either way, we’ll do a “real-time” analysis of the race on Sunday morning, so the splits and race report will be up almost as soon as it’s over!